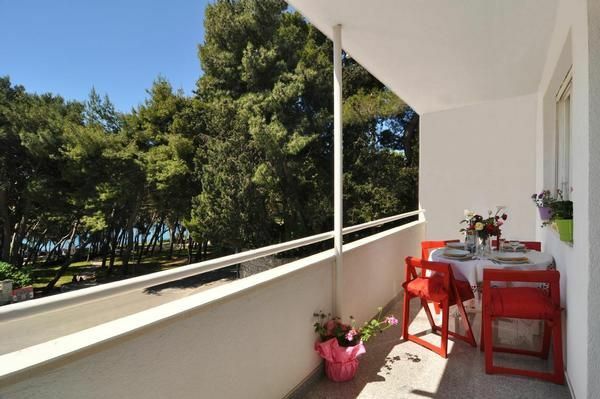 10 minutes walk from the City Center of SPLIT. For a beach and city holidays, perfect for families and couples. Comfortable apartment completely new and luxuriously furnished with custom-made furniture, equipped with every comfort, with large terrace and stunning sea views. Just few steps from the beach, popular local restaurants , tennis courts , children's playgrounds , pubs and discos along the promenade . The apartment is located on the first floor: safety door, entrance hall with cupboard , living room with large corner sofa (which becomes extra bed) , glass table with 6 chairs, LCD TV with satellite and cable TV, wi-fi internet, from living room leads to the terrace with sun loungers, table and chairs, all with sea view and pine trees on the front of the house. Kitchen: super-equipped with oven, ceramic hob , dishwasher, large fridge with freezer, kettle, toaster, mixer, coffee machine , coffee maker, everything you need for cooking , glass table for 4 people. Bathroom: with underfloor heating, radiator, shower, washing machine, ventilation. Air conditioning / heating in all environments, even in the kitchen. Also available: hair dryer, vacuum cleaner, iron and ironing board, all the necessary to keep the apartment clean, liquid soap, toilet paper , washing up in the bathroom, in the kitchen detergents and sponges , dish towels. For children and baby: baby cot, buggy, high chair, board games .